Installing a door is not as easy as it may seem. Many things can go wrong especially when you don’t know what you are doing. If you are inexperienced and decided to go the DIY course, you may end up spending so much time trying to install it which might just create more problems. Here are some of the most common door issues that homeowners find especially when doing DIY doors St. Louis installation. Door doesn’t fit to the door stop. This might be caused by the bottom plates being out of alignment. For sure it is caused by a number of things such as the door jamb not being on the same plane. Door that is not level. This can be caused by two things: a door hinge that is out of plumb or the flooring is not even. The former can be remedied easier than the latter. You might have to check for the plumbness or adjust the gap between the door and the floor to solve the issue. Loose screws. Due to constant use, the screws tend to loosen up. In a lot of occasions, you will find a problematic door caused by loose screws. It may be that the hole is too big for the screw you have used. Squeaky sounds. Everytime you open or close the door, you get an annoying squeak. It is usually a problem with the hinges and the hinge pins. You will have to adjust the hinge pins and apply oil on the hinges. Many people assume that by going DIY with their door installation for a home remodeling in St. Lois, MO, will help them cut expenses. But lack of proper knowledge, tools, and an extra pair of h ands can make the job more complicated. 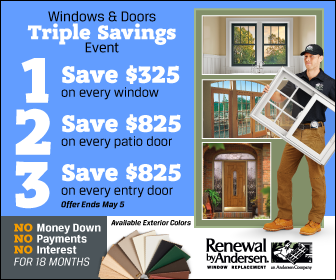 With Renewal by Andersen®, you and your doors are covered. We bring you the best solutions when you need to install new doors in your home. Our doors are made of the finest materials, designed with care and precision in order to add beauty to your home while providing you safety. When you purchase a new door from us, we also provide you installation services that will ensure your new doors are going to work perfectly. Call us now to find out more about our products and services!